United Kingdom is doing some pretty cool stuff these days. UK is proposing a new transport industry Internet system as an alternative to the cumbersome ways of transporting food from one location to another. The UK based Foodtubes Project which is a group of academics, project planners, and engineers are working on ways to have veggies, corn flakes and cans of baked beans to be sent in capsules along dedicated pipelines between cities. This is similar to how we transport water and gas. The new project called Foodtube aims at solving the complex issues of food transportation which will increase efficiency and reduce congestion, delay and over all costs. 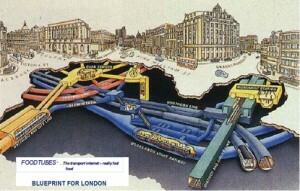 The FoodTube project is working on having a 1,500 kilometer underground FoodTube that would circle the UK. The system would use Internet technologies and this packet-switched-style network would connect all major food producers and retailers via 3,000 kilos of smart grid controlled air pressure pipe. The capsules would travel one meter apart from each other and will travel at about 100 kmph or about 65 miles per hour. As many as 900,000 will be in circulation at any given moment is what the project estimates. “Inefficient food transport costs the Earth,” another presentation insists. Food transport puts a huge burden on food trucks and also gas prices and contributes to a chunck of pollution. Presenters say that, “In contrast, we transport 180 times more weight of water than food every day in pipelines, with little pollution and no traffic jams”. However FoodTube has a long way to go thanks to the current systems in place and the unwillingness of food companies to try to adapt to the new system. It will take a while before this is even tested, but if this works, I might expect a pizza coming out of a tube at my home with a 5 minute wait time and no tips! Next Google Launches Google E-Books!